FAIR LAWN, NJ – SEPTEMBER 12, 2017 –The Women’s Choice Award, known as the trusted referral source for women, is delighted to honor Premio Sausage® for earning the 2017 Women’s Choice Award®. The award is based on extraordinary recommendations from their female customers in a customer satisfaction survey conducted by WomenCertified Inc., using the company’s customer database. Women have remarkable spending power and it’s continually growing. They currently control the majority of the purchasing decisions for consumer goods in America. Women are also likely to influence or manage big-ticket purchases as well as everyday purchases, according to a Nielson Report. That, together with a Forbes article stating that word of mouth has been shown to improve marketing effectiveness by 54%, reveals the significance of being a highly recommended brand by women. Premio Foods has been making fine Italian sausage for more than four decades. Its selection has expanded from Italian sausage to a wide range of classic and ethnic varieties, including chorizo, kielbasa, and bratwurst. Women look to Premio for healthy and delicious sausage they can feel good about serving their families. The brand’s chicken sausage, for instance, has up to 60 percent less fat than USDA data for beef or pork sausage. This is just one way Premio proves its commitment to women, by offering better and healthier choices. The company’s website also includes a recipe page where they compile a wide variety of meals, perfect for occasions such as holidays, tailgating, grilling or simply a family dinner. Women appreciate the array of choices included in this feature. It can be difficult to account for special food needs within the family, but the Premio recipe page even breaks out gluten-free and low-carb options to cater to busy moms who need special meals for their families. “We are pleased to salute Premio Sausage® for their focus on excellence, a commitment that is recognized by women consumers nationwide,” said Passi. Premio Foods, a traditional and family-run business, is one of the nation’s largest sausage producers. For more than 40 years, Premio has provided quality sausages for all occasions. Premio’s line of sausage products, which include pork, chicken and turkey sausage, are available at your local, grocery store. The perfect blend of butcher-quality meat, seasoning, and spice sets Premio apart — THE WAY SAUSAGE SHOULD BE. The Women’s Choice Award sets the standard for helping women to make smarter purchasing choices. The company and its awards identify the brands, products, and services that are most recommended and trusted by women. Additionally, they recognize those that deliver a recommendation-worthy customer experience. Awards are based on surveys of thousands of women, as well as research conducted in partnership with the Wharton School of the University of Pennsylvania. 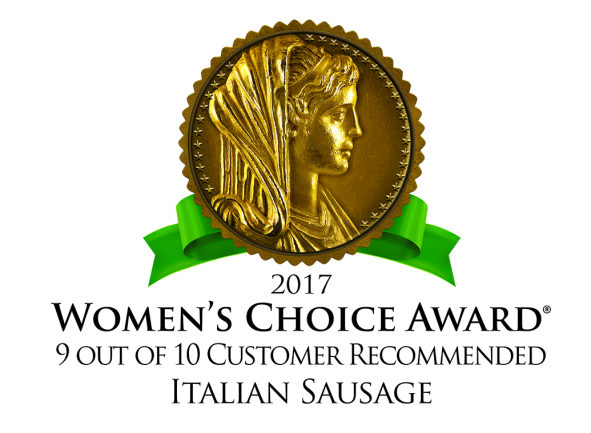 As the trusted referral source for women, WomenCertified Inc., home of the Women’s Choice Award, created the first national award based on the ratings and preferences of women. Women can visit the official website at www.WomensChoiceAward.com to learn more. Florencia Latino | WomenCertified Inc.
Jared Rakotci | Premio Foods, Inc.
Hi Grace! Each store has a meat manager(s) or buyer, who determines which products they will stock their shelves with. If you can’t find the Premio varieties you like at your local store, talk to your meat manager; he/she should be able to order you the sausage you desire! I recently purchased Premio’s Chicken Cheddar Bacon sausages at Costco. Do you know of any other stores that carry them? Hey Janet, our Chicken Cheddar Bacon sausage is actually only available at Costco locations on a limited basis. We’re glad to hear that you enjoy it!